LAURELTON, Queens (WABC) -- The NYPD says Saturday's 'Cash for Guns' buyback in Queens was a success. 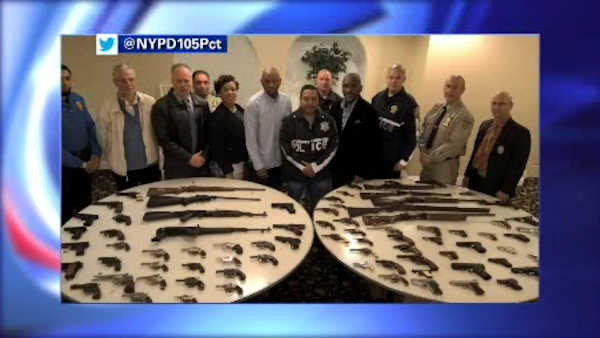 The 105th Precinct tweeted a photo of the dozens of working guns taken off the street. There were 89 in total, including two assault weapons and 46 revolvers. People who turned in their guns at the Evangel Temple in Laurelton were given anywhere from $25 to $200, no questions asked. "The ultimate goal of this law enforcement initiative is to get as many guns as possible off the streets of Queens County and make our community even safer for everyone," said Queens District Attorney Richard Brown. "The support of the community is critical to the success of this program and emblematic of the level of cooperation needed by law enforcement to ensure the safety of all residents of Queens." "Through the gun buy-back program, the NYPD continues to work closely with our law enforcement partners and members of the community to reduce the number of illegal firearms on our streets," said Police Commissioner William Bratton. There was no limit to the number of firearms a participant can surrender, but there was a limit of three pre-paid cards per person.